We recently did one Fine day wedding fair at Melbourne and this little gorgeous girl was a stand out with our visitors! So pretty and sweet, the whimsical illustration sets such a lovely tone for a wedding. 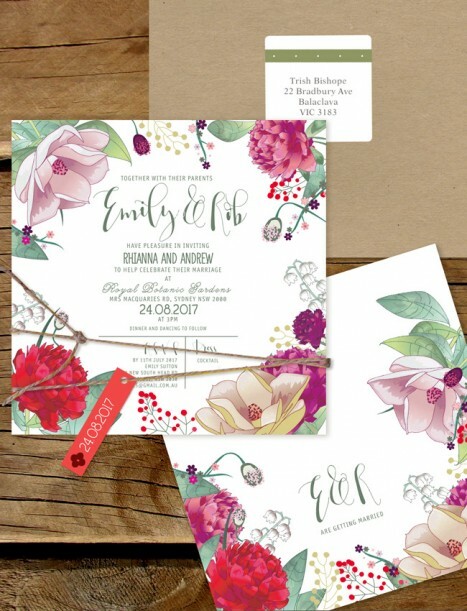 We have mixed it with a rustic kraft envelope here for that raw edge but we can use a different colour too :) As part of our cheaper flat card range - this is truly an amazing option for getting a stunning designer piece to wow your guests at a great price. Combined with the artfully scripted fonts this design is a knock out. We love the sassy red splashes for flair, but we can also colour change this design to match your theme as well. We hope you love it!